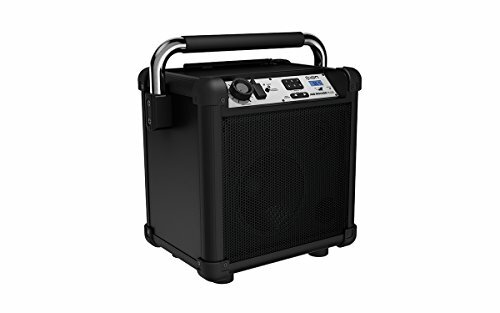 When you’re at a jobsite, working around the house, or blowing off some steam on the weekend, you want a speaker that has enough power to stay on your level. ION Audio’s Job Rocker Plus comes ready to stream music wirelessly from your smartphone or tablet then blast it out at 50 watts. The wireless Bluetooth connection lets you keep control of the playlist while you work up to 100 feet away. Or you can switch to AM/FM radio when you don’t want to miss the game. Its built-in battery ensures the jobsite is taken care of for up to 50 hours between recharges, and it has connections for both AC power from a wall outlet and DC power from your vehicle. We built Job Rocker Plus’ cabinet to take a beating. Its heavy-duty steel handles and protective corner bumpers mean you can stay focused on the job and not worry about damaging the radio. Plus, Job Rocker Plus’ large rubberized controls are easy to handle even with gloves on. Finally, it comes with a 1/4” mic input for to use for important announcements, or take with you on the weekend for karaoke with friends or family. It’s the easiest way to play while you work.